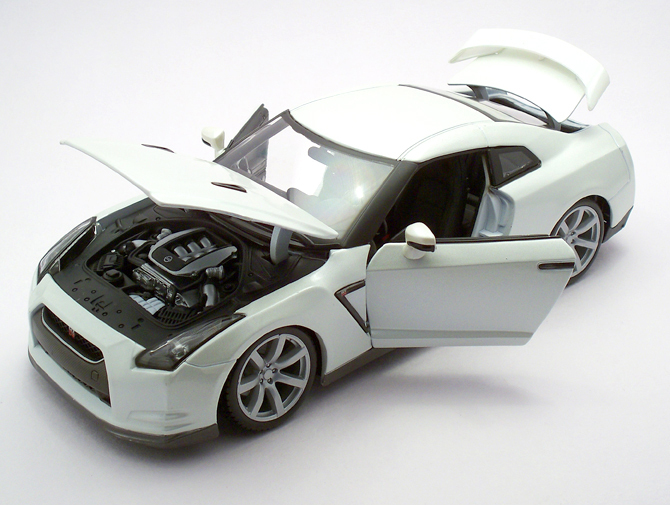 The GT-R is a sports car produced by Nissan from 2007 to succeed the skyline GT-R and marketed as a “Multi Performance Supercar” by Nissan. 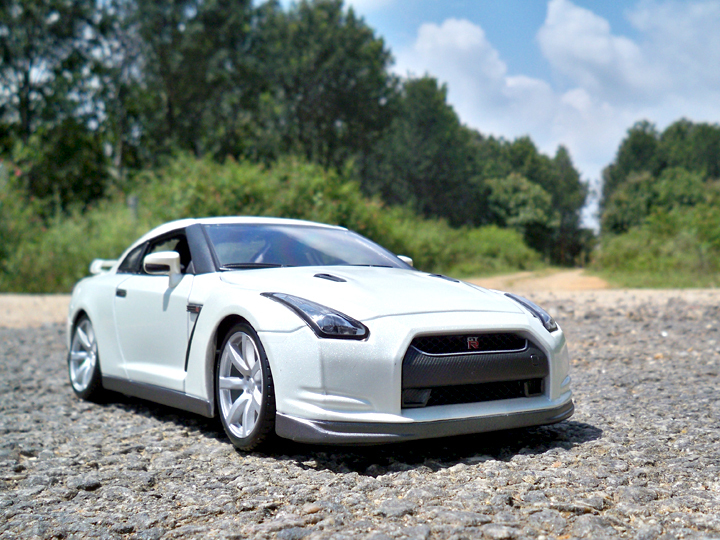 Like the Skyline GT-R (R32 through R34) the Nissan GT-R is all-wheel drive with a twin-turbo 6-cylinder V6 engine. The 3,799cc engine produces 485Bhp at 6400rpm which can propel this car to a top speed of 311kmph. A 6-speed semi-automatic dual clutch transmission along with Nissan’s Vehicle Dynamics Control gives him brilliant dynamics on tarmac or on snow. 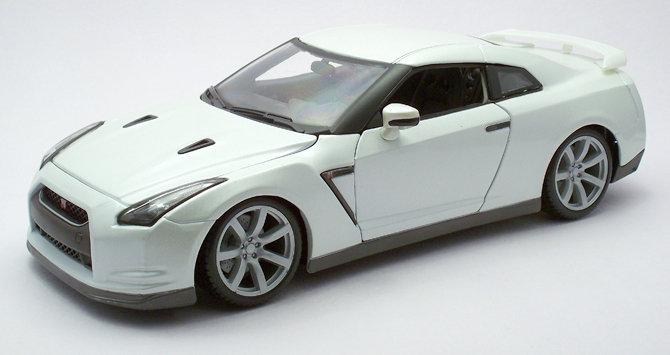 This GT-R has also retained its Skyline predecessor’s nickname Godzilla. 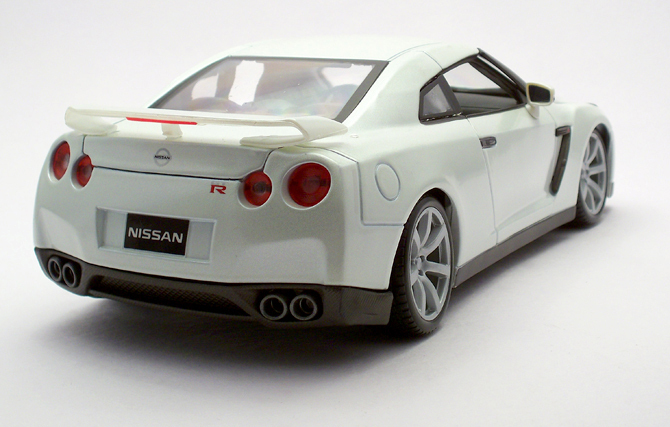 This Nissan GT-R model is made by Bburago in my favorite scale 1:18. It also comes in black and also in bright red but I picked this ivory white color because it looked better that the rest. 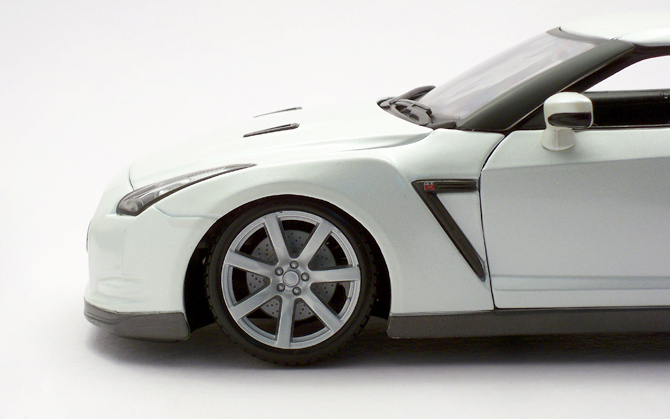 The body work is awesome and the gaps are very minimal. The headlamp seems a little bit interesting thanks the dark smoked glass and milti level headlight projectors and snazzy indicators. The “GT-R” logo in the front grill and carbon finished cladding are very cool. The air vents in the bonnet is nice touch to interest you but the rear view mirror mounted side indicators are in pure black and looks boring. The super car stance is well maintained and the dimension is great (no bigger or smaller bits and pieces to hamper) and the matt like paint finish is gorgeous. I liked this color more in outdoor photo shoots and also in my showcase. The lower matt black plastic cladding is very nice too. Wheels are detailed and the disc pads are nice and drilled pattern is deep. Though detailed the missing “NISSAN” logo in the alloy wheels is definitely a miss-out. The tire pattern is nice and sporty. The model come with a functional steering system but its a kind of springy so the wheels do stay in straight up position all the time. As with the interiors the steering wheel and center instrument console steals the show. The neat addition of red accents is very appreciated. 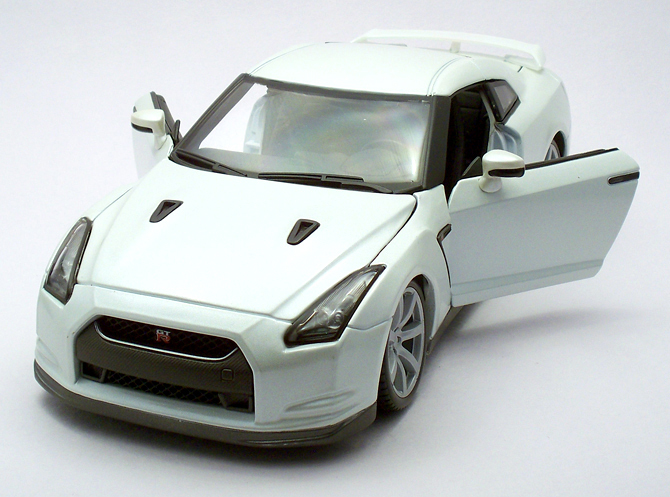 On first look I felt the “GT-R” logo in the steering is big but later realized that the real car also has a huge logo. The gear shifter is chunky and huge by any mean so as the hand brake lever, which indeed is keep in engaged mode. Seats are plasticky and has no texture even on them. This being a four seater all seats are provided with seat belts! The front seat belts almost hidden behind the front seats. 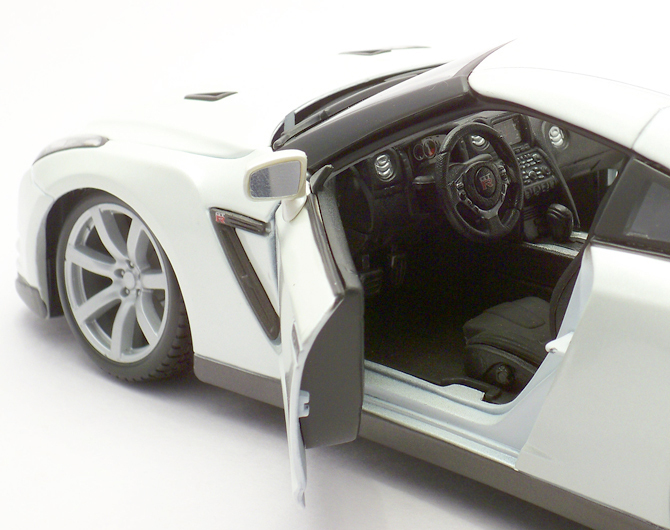 The door opens up a little just enough to reveal the interior’s glory and looks very cool. The credits in the door job goes the typical “Maisto and Bburago” hinge mechanism which don’t shows up like the one which come with Welly and few old “Maistos”. The engine bay is quite interesting and detailed with the aluminum addition. The turbo charger is very detailed as well which deserves a thumbs up. The trunk also poops up to reveals a deep luggage bin. Hi , I got this model too… but only in red color… I want to put pictures but I can’t because that my father don’t know about that yet… I need to reach the date Dec. 25 to say it to my father…. It means this one is a small secret that I want you to know…. I got this model with few Imperfections…. 1. exhaust pipe at right of mine is not that exact how the left side is..
: AWESOME : …..totally AWESOME!!! What would be your name ? I’m online already . if I can’t add you . Here’s my name on FB . My picture says . “Teach me Cabidougie” . I took this guy from “Saphire” and that time they had some where around 10 pieces lying around. uh … buddy … mei I ask what’s your name on Fb ? My name is “Terence Espedilla” . I used your CCX header . with Fog Effects . . .
Thats fine.. not an issue.